Recently I came across this honest confession from a Expert in Mutual Funds. 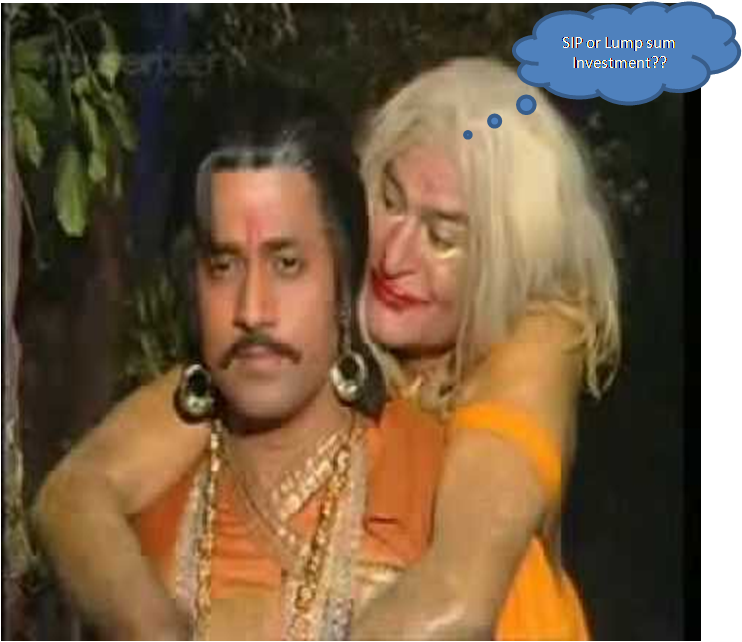 """I know it is impossible to time the market.Last year when the sensex was around 20500 I made lumpsum investments in HDFC Equity Fund,HDFC Top 200 Fund,Birla Sunlife Frontline Equity Fund and UTI Opportunities Fund.My returns from these funds are still negative.On the other hand I am getting decent returns from my investments in Kotak Mutual Fund and ICICI Prrudential Fund where I am investing through monthly SIPs for the last three years.The lesson which I have learnt is that long term monthly SIPs even in average funds are much better than lumpsum investments even in the best performing funds.""" SIP is the best route for investment in mutual funds to meet your long term goals. The greatest advantage is that once you start a SIP you can remain invested for a long time without bothering about the short term ups and downs of the market. The greatest disadvantage of lump sum investment is that you become a hostage of market timing.While it will be foolish to invest lump sum when the sensex is at around 22000,it makes sense to invest at a level of around 17000.You can always invest some lump sum whenever there is a sharp correction in the market. All mutual fund investments are subject to market risks. In the short term you may see a lot of volatility and returns from your investments may even be negative. But if you remain invested for a longer period of more than five years in equity mutual funds, there is a potential of creating wealth. SIP is the best mode of investment as you don’t have to bother about market timing.In lump sum investments you become a hostage of market timing.Yes, you can do some lump sum investment when you see the market correcting substantially.You can combine both modes of investment. You can select any tenure for your SIP and you can increase or decrease it as per your requirement.You can also redeem whenever you need money.You have to only see exit load and tax implications. IF YOU HAVE A LUMPSUM AMOUNT TO INVEST., THEN GO FOR A DEBT FUND AND OPT FOR A SYSTEMATIC TRANSFER PLAN. THIS IS THE BEST OPTION.